Total Guitar issue 217 is now on sale. Featuring an expansive look at Thin Lizzy's incredible collection of guitarists past and present, including interviews with everyone from Scott Gorham to, err, Midge Ure, it's the definitive word on the rock legends' six-stringers. 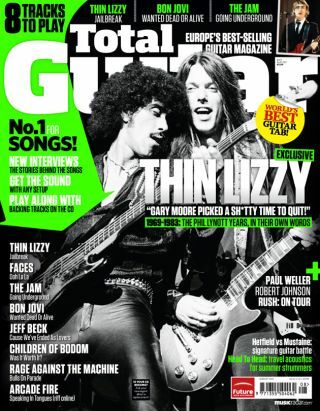 Eric Bell, Brian Robertson and longest-serving guitarist Scott Gorham join TG to celebrate the legacy that is 'Lizzy. In an exclusive interview the modfather himself talks to us about the writing and recording of The Jam's definitive classic 'Going Underground'. TG heads to the Mississippi Delta to investigate the chilling tale of the legendary blues guitarist. Yet another exclusive, the quote machine and Rage Against The Machine guitarist tells TG all about the creation of their "certifiable jam" 'Bulls On Parade'. On their first album proper, Glasgow's alt rockers put fads behind them as Gil Norton takes to the producer's chair. Read the stories behind the songs, get the sound with any setup and play along with backing tracks on the CD. Click the links above to be taken to the individual lessons or just browse all of the video lessons for issue 217. Highlights this month include a head to head battle of signature thrash axes, with the LTD James Hetﬁeld Snakebyte vs Dean Dave Mustaine Zero, the Dime Ampliﬁcation D100H and Fender Pawn Shop Series Mustang Special. In addition, the Vox Series 22, Takamine and Tanglewood travel acoustics, Electro-Harmonix Stereo Talking Machine, The Creamery Wide Range humbuckers, Line 6 POD HD, ToneButcher Pocket Pus and MXR Custom Badass '78 Distortion are all reviewed in Total Guitar issue 217. Win TC Electronic pedals worth £848! We've teamed up with TC Electronic to offer one reader a grand total of eight of these coveted effects demons - that's an entire 'board's worth of pedals.